The Tag Registry View allows a JSF user to browse the JSF tags declared in each project including information about what components, converters and validators they create at runtime. The Component Tree View allows a user to browse a design-time approximation of what a view (i.e. a JSP page or Facelet XHTML) will look like at runtime. This component tree will also be used by an increasing number of component-based features in the future. 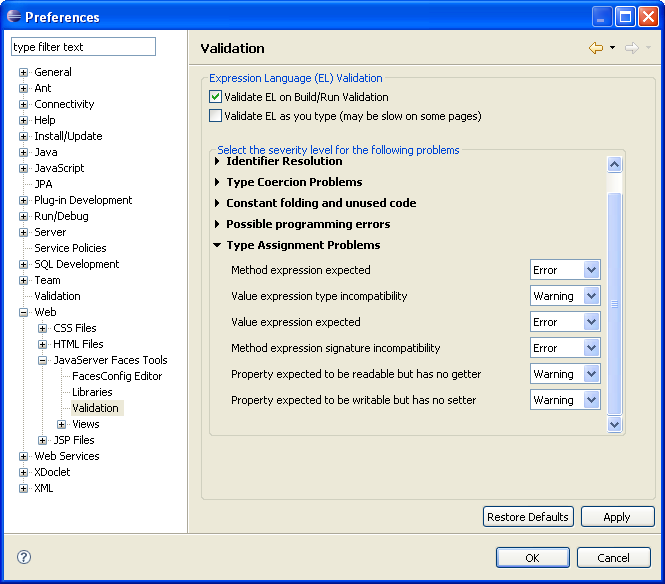 The Source tab of the Web Page Editor (WPE) supports Hyperlink on a Managed Bean variable, Managed Bean property and Managed Bean method referenced in the Expression Language(EL) of a tag-attribute. Users can (Ctrl+click) on the hyperlink to navigate to the source of the Managed Bean. The Source tab of the Web Page Editor (WPE) provides Hover Help on all symbols defined in the Expression Language(EL) of a tag-attribute including references to Managed Beans and Resource Bundles. The tabbed property pages in the Web Page Editor (WPE) have been enhanced. This change is important for adopters of the project. See Enhancements to WPE Property Pages for details. 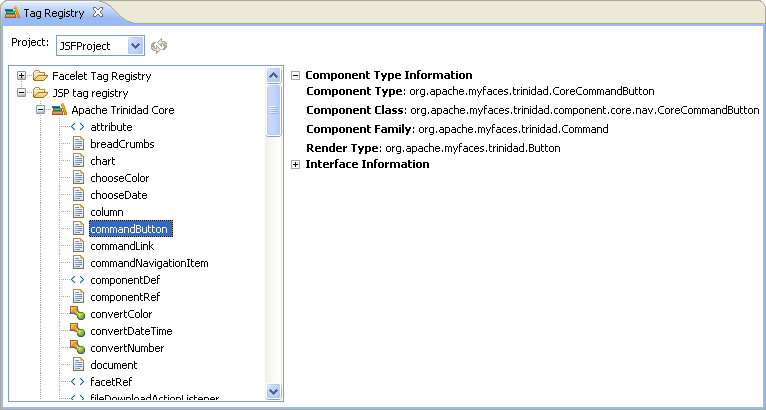 Apache MyFaces Trinidad tags are now supported in the Web Page Editor, in source editors, and in the Properties view. Thanks to Xiaonan Jiang at IBM for driving new framework requirements and providing prototypes. We have refactored several internal symbol creation methods and combined them with contributions by Matthias Fuessel and Xiaonan Jiang (IBM), to create a new set of extension points to simplify creation of common JSF symbols. See here for more details. We have also made the symbol creation methods available on a new factory called JSFSymbolFactory. New validation preferences for EL validation problems allow you to change the severity of type assignment problems between Error, Warning and Ignore.